Click LINK below to download the PDF of the Introduction and English eBook Artwork for the OSIRIS-REx Spacecraft submitted to NASA by Ken Kozy. NASA (National Aeronautics and Space Administration) confirmed that all submitted Artwork was included in the memory bank of a future spacecraft. This included Ken Kozy's eBook. This unmanned mission is the OSIRIS-REx (Origins, Spectral Interpretation, Resource Identification, Security - Regolith Explorer). It will be the first U.S.A. mission to collect a sample of an asteroid, return that to Earth for study, and continue on into space as a time capsule. On September 8, 2016 this spacecraft was launched from Cape Canavaral Air Force Base in Florida. In two years it will become a “friendly visitor” to an asteroid named Bennu where it will perform a scientific study of the asteroid with its state-of-the-art instruments. How does this spacecraft’s mission affect us today? 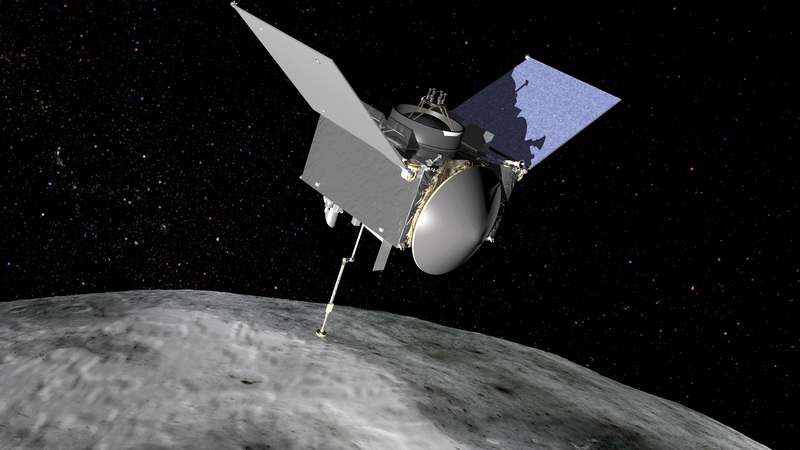 Well, NASA invited the world to submit artwork which OSIRIS-REx will carry in the spacecraft’s memory chips forever. Based upon their invitation, Sun City Huntley Illinois resident, Ken Kozy, submitted his digital artwork of creative prose and photos to NASA. A Baby Changes Our World - A Christmas Nativity Story. It appears in 7 languages - English, Spanish, Italian, Portuguese, Polish, German, and Chinese. These languages are spoken, read, or written by over 30% of the population of Earth. Therefore, these computer-generated translations could serve as a “Rosetta Stone” in some future millennia whenever the spacecraft is discovered. The discoverers should be able to read the eBook and learn about the Nativity of Jesus Christ which occurred over 2,000 years before today – a belief held by over 2.2 billion of Earth’s current population. Brief Introduction to 7-Dimensional eCommunication Concepts which were utilized in development of the eBook and identified essential communication characteristics of today's humankind for the spacecraft’s discoverers. He added a prayer and blessing for the people of NASA Administrationd their mission to safeguard the earth from impacts of asteroids. Three years ago, the Bennu asteroid passed closely to Earth. Bennu is big and looks like a rocky globe which has a diameter of about 1,600 feet (492 meters, almost 1/3 mile). If its predicted 436-day solar orbit path continue, this asteroid probably will not hit earth until 2182. And then, what a BANG and destruction it potentially could make if we collide! So, it’s worth the tax monies for the $800 million (plus) budget to visit it, study it, analyze its composition, and determine how to change its course. The asteroid also may hold clues to the origin of the solar system and the source of the water and organic molecules that may have made their way to Earth to begin "life." Science will also study the effects of the Sun on the asteroid's orbit. We can all wonder: who will be the discoverers of the OSIRIS-REx spacecraft orbiting the Sun thousands of years from now? What will they think as they analyze and understand the contents of this time capsule? Will the spacecraft be “re-discovered” by future humans or by visitors from outer space? After all, who knows what wonders God has created in our Universe? We are just now finding out about some of them via our space telescopes and explorations. The submission to NASA included a prayer and blessing for the people of NASA along with 3 creative photos. * Graphics and pictures of space & objects are courtesy of NASA. ** This is the copyrighted property of the United States Postal Service® (Postal Service™). All rights reserved.